This is a guest post by Jerry Noel. In this article we'll discuss how to examine your site to decide where to place solar electric panels, and in the next article we'll look at financial incentives available to help make them more affordable. In Part 1 (Solar Electric Basics), Jerry discussed the three predominant questions of solar power: cost, batteries, and “DIY”. Part two provided Emergency Power Options. Article 3 discussed three types of home solar power projects and how to mount your solar panels. What is a Professional Solar Site Assessor? A professional solar site assessor is someone who has been trained to evaluate locations to determine whether they are a good fit for renewable energy projects. The MREA has a list, by state, of licensed site assessors for Solar Electric (PV), solar hot water, and small wind. Some renewable energy rewards programs insist that you hire a professional site assessor before you can collect rewards. While it may sound unnecessary in some cases, this policy prevents unscrupulous installers from selling you a bad system that will never produce what you were told it would. Site assessor will often have specialized tools such as a Solar Pathfinder, Solmetric SunEye or Smartflower. If you do call for a professional site assessor, check with them to see if there is a local rebate program. Some site assessors are also installers and if you hire them to design and install the system they will credit you the cost of the assessment into the overall system cost. Don’t hesitate to ask the site assessor those types of questions over the phone or via email. Before you hire a site assessor, there are some basics you can check yourself. A good site for a PV array in the northern hemisphere has a location that is within 10° of true south. (In the southern hemisphere, you want to be within 10 degrees of true north. More on placing panels for our Australian readers at Australian Sun Energy.) Remember that true south can be widely different than magnetic south. The US Geological Survey has a map showing the declination lines. Along the Mississippi River, True North and Magnetic North are close enough to ignore. In California, they are from 12° to 17° off. The ideal system will also have a tilt angle of your latitude (minus) 10°. In Madison, where I am, we are at 43° north, so my system should aim for 33° tilt. The idea is to maximize output during the longer days in summer. 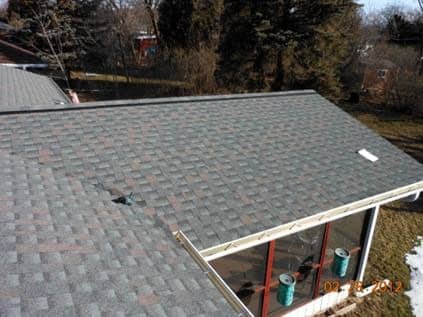 If your roof is a 4-12 pitch, it converts to 18.5°. That is fine. Raising the back edge to increase the tilt angle will only gain you a few extra percent of production at the expense of higher wind loading. More wind load means more structural stress and more supports. The extra cost exceeds the production gains. It also means more roof penetrations and potential leaks. 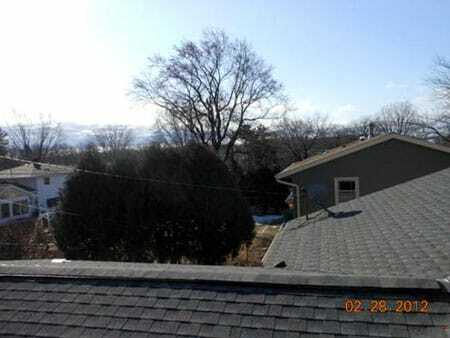 Even a flat roof can be a good location for P-V. A roof that is greater than 45° would not be ideal. I will use my old house as the example for this article. The roof had a 5-12 pitch or 22.5°. The main ridge of the roof is north-south, but the house had a 3-season porch off the back that has a south-facing roof. The lower edge is only 17’ and there is 11’ of vertical space. That may not seem like a lot, but it can still be productive. Next, a good location has a “solar window” with minimal shading from 9 am to 3 pm. Shading really knocks down the production. Here is what the southern view is from the roof. Notice the large maple tree directly south of the proposed site? If the shading is low enough on the horizon, it isn’t much of a factor. It may affect winter production, but summer is what we are most concerned with. This tree is mature and will grow vertically very little. Young trees that are closer are more a concern. 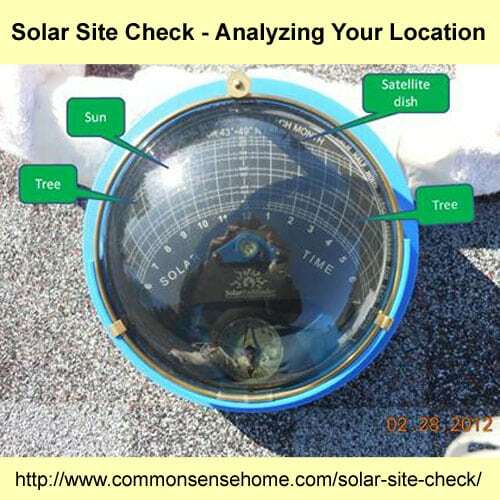 The basic tool for determining shading of a site is a Solar Pathfinder. It is a low tech device that works really well. 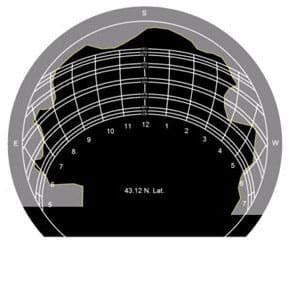 A high tech tool used by many professionals is the Solmetric SunEye. I have a Pathfinder and have not had a need to upgrade and spend the extra $2000. There also is an I-phone app by Solmetric. Both tools show the necessary shading information. I also have the Pathfinder Assistant software to analyze the shading and generate a report showing how much shading there is month-by-month (Solmetric does the same). At the top of the post is an image taken of the Solar Pathfinder. The photo is taken facing directly down onto the reflective bubble. If you look closely, you can see the trees on the horizon. Below is a shading analysis of the first picture. The software report tells me that my location has 8% shading, but looking at the picture we see that it is early morning or late afternoon. We can live with this. We have an open solar window from 8am to 3:30 pm, and longer in summer. In fact, the large tree to the south does not even block the array in winter. So now we know we have a decent location; time to take the next step. In the next article we'll look at options to make you solar electric system more affordable. Currently, Jerry is a foreman for Krantz Electric in Verona, WI. They are located a few miles to the south-west of Madison. Krantz Electric does residential, commercial and solar electric projects. In the past, he has taught solar electric theory and installation for the IBEW , Midwest Renewable Energy Association, and Solar Energy International. Please visit the Krantz Electric website for more information. Over the course of upcoming posts, he will do case studies using their old house (they just moved) and their new house to give you a more in depth feel for what is required, how it is put together, and possibly the costs involved. As always, be safe. Hire a licensed professional before trying to play with electricity; it can and will kill you!